Hartwig has joined the Oklahoma Manufacturing Alliance as an affiliate member. It now partners with other organizations in supporting the vital economic development work that grows state industry. Since 1960, Hartwig has been a machine tool distributor known for superior service and support as well as our integrity. With over 12,500 machine installations, it has combined high-quality equipment with applications expertise and support to help customers meet and exceed their manufacturing goals. The company specializes in turning, milling, grinding, inspection, and additive manufacturing technologies. It has grown to more than 180 team members supporting customers out of nine office locations in 14 states including Oklahoma. Hartwig provides manufacturing solutions and support to the machine tool industry by partnering with customers to optimize machining performance, decrease downtime, and improve the overall efficiency of equipment and applications. Hartwig prides itself on not only being a machine tool distributor but a true solutions provider intent on assisting customers in controlling their destiny and keeping manufacturing within the U.S. It is a CNC machine tool expert, armed with industry-leading technology and knowledge and it is there to assist you with your demanding industrial applications. The support staff is dedicated to professional machine tool repairs and expert customer service. 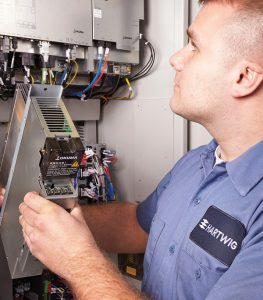 Hartwig demands excellence in its products, people, and processes. With this in mind, the company has carefully chosen industry-leading brands that have both a reputation for greatness and the ability to provide a complete range of machining solutions for customers. For more information, visit Hartwig’s website at www.hartwiginc.com or click here to drop a note to Shannon Sallee.